Dear quilting world -- we need to talk. Now. We need to talk about why an amazing, comprehensible, gorgeous pattern isn't ragingly popular. Say hello to the Carpenter's Square pattern. Oddest of all? 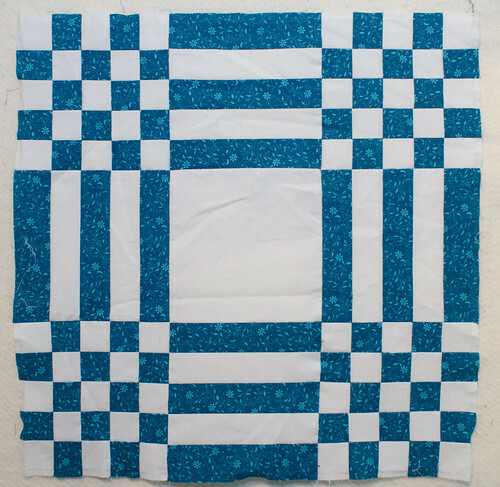 Very few people are making quilts from this design, which is madness, because this pattern's quite reasonable if you have a rotary cutter and a couple of good rulers. If a pattern was available for sale, I'd point you to it. It's not. Georgia Bonesteel published a pattern in her Spinning Spools series back in 1990. You can buy it secondhand by searching for carpenter's square block on eBay. That's what I did, and when I read through it I discovered the pattern's useless for rotary cutting, but it can be used as a blueprint. If it makes you feel good to buy a copy, go right ahead. Unfortunately, it doesn't look like the original author will benefit. C'est la vie. We're all adults here. You're here because you want something different, and you're willing to work for it. Great. I'm going to give you the basics, but you need to figure your own yardage, and settle on the finished size you want. 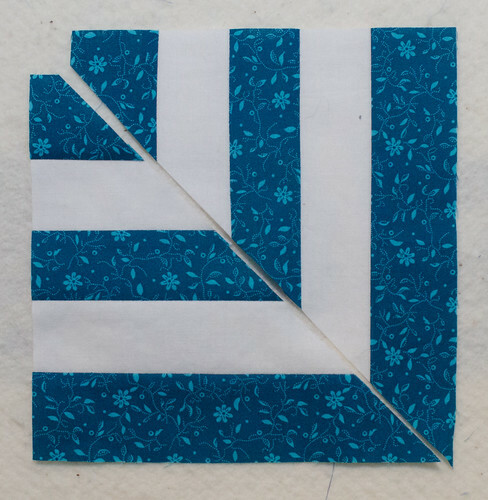 This approach is wasteful with your background fabric (go on, figure out how to cut the corner pieces) and requires you to fit angles together perfectly between huge blocks. There's an easier way. For the purposes of my pattern explanation, and my photos, my background fabric was white, and my foreground fabric was blue. Plain background fabric. You'll need squares and triangles. More on that later. Strip set A: 3 foreground (blue) strips, 2 background (white) strips. You'll need more of this strip set than strip set B. Strip set B: 3 background (white) strips, 2 foreground (blue) strips. Your magic numbers are 1¾ inches and 6¾ inches. 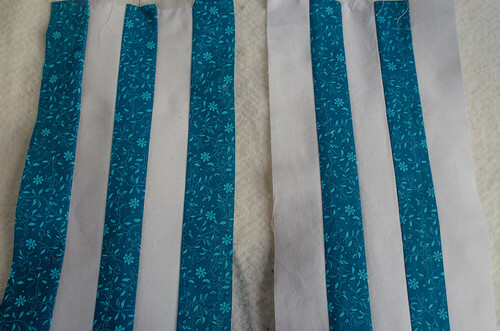 All strips for your strip sets should be 1¾" x width of fabric. 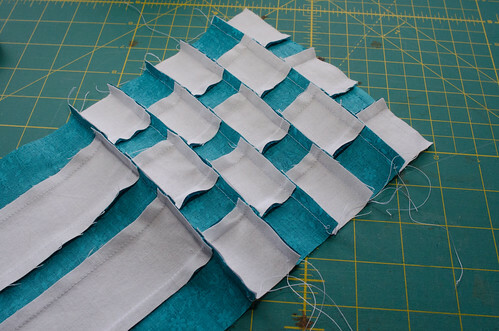 Press them with your seams toward the darker fabric. You'll find they nest beautifully. You will be making two types of blocks: the easy block, and the complex block. Swirl your seams toward the darker color. Pin before you sew; this pattern looks terrible if you aren't accurate. Press your block when you're done. Measured diagonally, It should be in the 25-26" range. I might have lied slightly. This block comes together faster, but it's more finicky to cut, and I don't have an exact measurement for you. Remember, when you're sewing, the bull's-eye part of the seamed square always points outward. Except for the edge pieces (and I have a recommendation about that, see below) ... that's it. Those are the only two pieces. Seriously. That's ALL. To get the look of the old pattern, these blocks should be sewn on point -- meaning, corner, not edge, points up. The original version of this pattern required you to do diagonal seams inside the blocks to get a square block that looked on point, but wasn't. I found matching the foreground stripes at the bottom of those big blocks to be more trouble than it was worth, plus cutting weird corner pieces to make a square block seemed silly. 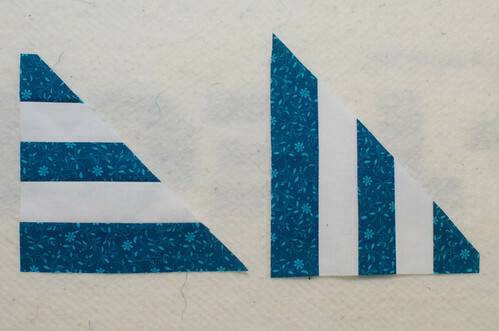 Why not just turn the pattern 45°, split it into two major blocks, and make it easier to assemble? In comparison, making your half-block from the complex block will require you to make partial checkerboards, which seems annoying to me. 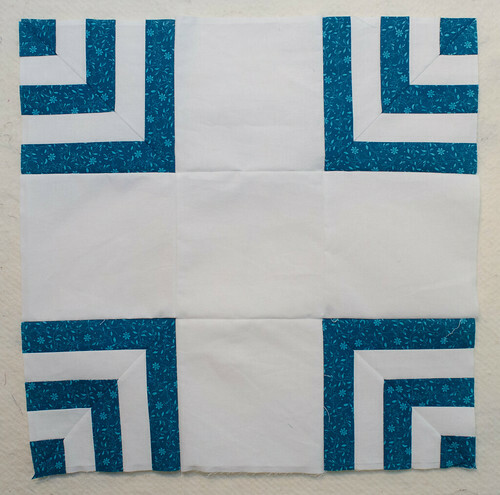 Since the blocks are roughly 25"-26" on the diagonal, a 3x3 grid, when filled in, gives you about a 75"x75" quilt if you don't add any sashing or borders. ...and I'm going to make a couple of requests of you, if you do. First, please don't sell this pattern. It's over a century old. If you calculate the triangle sizes for the edge and corner pieces, let me know and I'll update this post. This pattern is beautiful and deserves to be seen and loved and done by quilters everywhere. Second, I want you to take a moment. Give some thought to how art and artistry work in Western society. Somewhere out there, in Ohio, in Pennsylvania, in farmhouses and towns somewhere not too long after the Civil War, there were women -- almost certainly, women -- who made quilts based off of these patterns. The few instances of Carpenter's Square quilts that survive from the 19th century are collector's items. Works of art, even: and we do not know the names of their creators. We know the names of painters -- mostly male -- going back centuries. We know their names and their lives. These pieces of art were made by women whose names and stories we lost in just over a century. Treat your work like the art it is, and sign your name to it. We lost the names of generations of quilters because what they did wasn't considered "art." Make beautiful things, and let's ensure we don't lose any more names. How much of each fabric did you use? It looks wonderful by the way! I actually don't know. I worked on the quilt off and on for a couple of months, and didn't keep track. 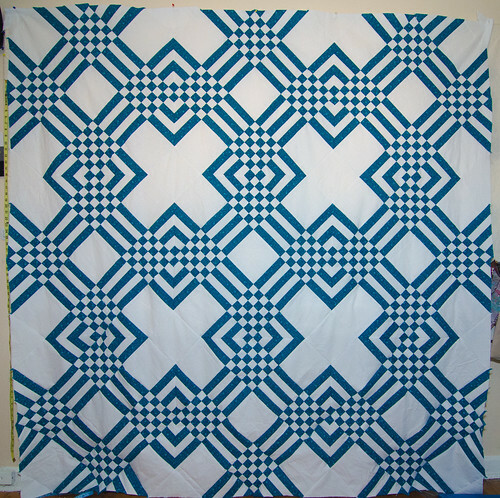 A pattern for this design made in browns (called Baked Alaska) is available in a book by Martingale's Patchwork Place titled "On-Point Quilts: Designs on the Diagonal" by Retta Warehime. It was published in 2008. I believe it is still in print because I bought my copy about a year and a half ago. Hey, that's useful info! I looked it up and it looks like the same block ... minor grumble at not referencing the traditional name of the block, which is why I never found this pattern in my searching.